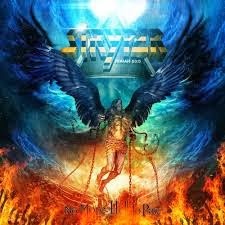 RockUnitedReviews: STRYPER - "No More Hell To Pay"
Let's be honest, we were all starting to wonder what the point was of having Stryper back. The covers album was pretty cool, but in the end it was a covers album. The re recordings of their old classics was also kinda cool, but rather pointless as it generally added nothing (and in a couple of cases made the songs worse). So it's a blesses (literally) relief to have an album full of new material from Michael Sweet, Robert Sweet, Tim Gaines and Oz Fox - originator's of the "Yellow & Black Attack" so many years ago. For my part, I've been a Stryper fan from way back, in the days when I was a Christian and out the other side in my more rational Atheism days. The music was so good, however, that it even got cynical old Atheist me singing along to such cheese as "Makes me Wanna Sing", although I was impressed by their rebellious teenage years album "Against The Law", where God took a well deserved rest. So first up it should be said that "No More Hell To Pay" is a return to the God Squad days, as Stryper sing about faith with much sincerity and passion, and this is only a abd thing when it just gets too silly, as on "Jesus Is Just Alright", a song with such an embarrassing Sunday School chorus I have had to delete it from the iPod just in case I start singing it in the street and people think I am deranged. With that aside, "No More Hell To Pay" is about as good as we could have hoped. The best thing about it is that it really sounds like the Stryper we all know and love. There hasn't been any attempt to change the sound or style, and they sound brilliant. Michael Sweet's vocals are impeccable, especially when he is allowed to go a bit mental as he does on the blistering rocker "Saved By Love". Naturally, there's a syrupy ballad in the shape of "The One", and it's okay but no "First love" or "Together As One" to be honest. Elsewhere the song titles certainly transmit the band's message, as in "Marching Into Battle", "Water Into Wine" and "Revelation". One of my favourites, apart from "Saved By Love", is "Te Amo" (Spanish for "I Love You") - a perfectly paced track that benefits from a beautifully melodic chorus (very classic Stryper) and some pounding drums from visual timekeeper Robert Sweet. It should also be said that throughout the album Oz Fox provides some really great guitar solos, making the few lesser songs much more listenable. Also got to know these guys in my christian days, and I must say, what I've heard of this so far has gotten my now atheistic self pretty excited!